Tarps are an inexpensive way to make camping in the British climate that bit easier. In fact, you should take at least one tarp when you go camping. On a recent camping trip we had a lot of rain. A lot of rain. Fortunately, we had put up a large tarp shelter, and with a few wind breaks, we had somewhere dry to cook and sit by the fire. Other campers could only stay in their zipped up tents. We also take a large tarp to place on the ground, especially when it has been raining and bad weather is forecast. A belt and braces approach, but it does stop the bottom of the tent sitting directly on the wet ground. So why do you need a tarp? If the ground is wet and muddy, you can pitch your tent on top of a tarp as an extra ground sheet (just make sure all the tarp is tucked under the tent). When you come to take your tent down, the bottom of your tent should be nice and dry. Somewhere to cook, eat, and shelter from the rain. Remember you should cooking outside, not in your tent. A tarp lets you eat even when wet! An impromptu shelter when pitching in the rain, enabling you to get your gear into your tent but stay nice and dry. Enjoy a campfire when it’s wet. Use tarps and windbreaks to trap more of the heat. 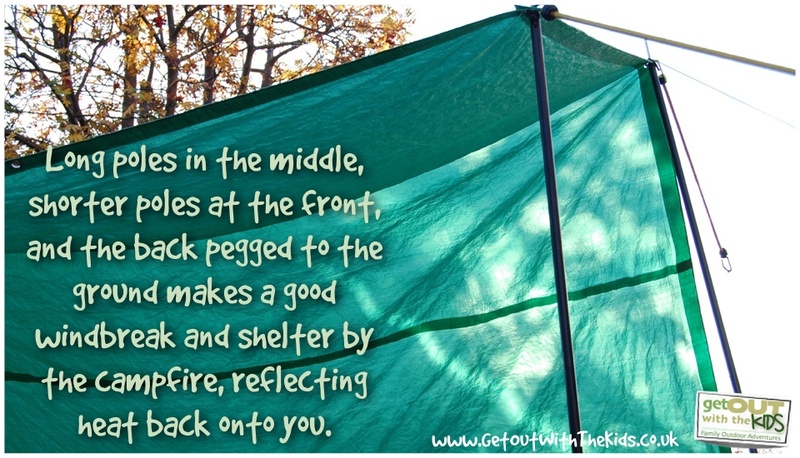 Create a play tent for your kids. 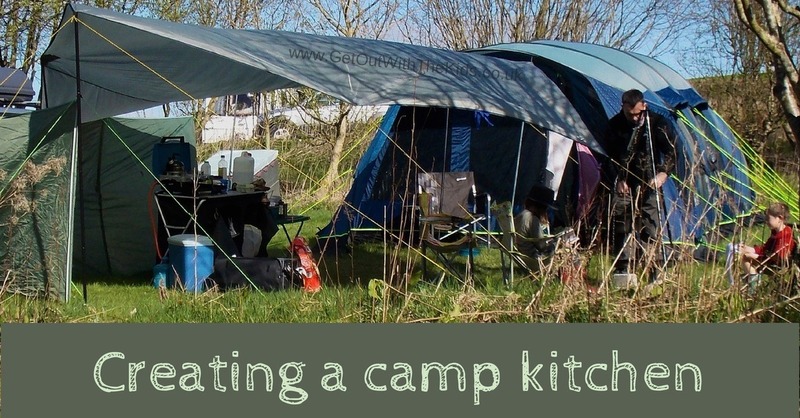 You can find more about creating a camp kitchen under a tarp by clicking on the picture below. 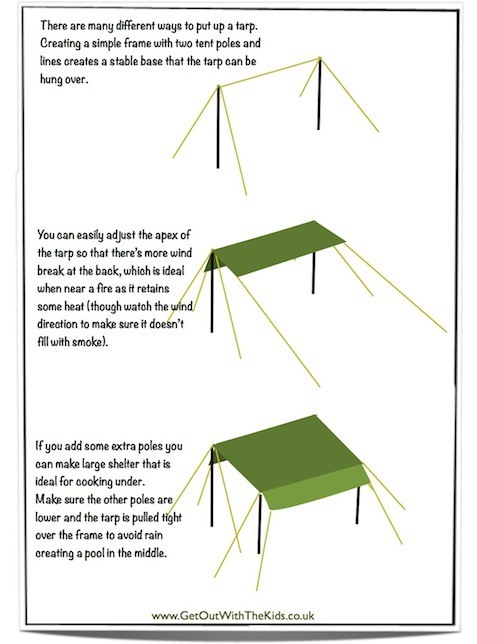 There are a few different ways to set-up a tarp. Wind direction, the location of trees or other supports, and what it will be used for, all influence the choice of shape. You can build a basic shelter using two straight tent poles, rope, pegs, and, of course, a tarp. With some little helpers holding the poles, you need to run a line between the two poles. The excess line is taken and pegged into the ground to help hold the poles in place. This is known as the ridge line. Run another line from each pole and peg into the ground. You should now have what might look like a washing line. The poles are freely supported by two lines plus the line connecting the two poles. Pull the tarp over the line. Run lines from the corners of the tarp and peg into the ground. You can move the tarp to change the apex of the shelter. For example, you may want more tarp on the back of the shelter and less at the front. The front can be positioned near the fire, letting smoke out (and reducing the risk of accidents), yet leaving enough tarp for comfortable shelter. An apex helps with rain run-off. Even if not raining, this setup is good at trapping some of the heat from the fire. You may want to place windbreaks around the shelter for added protection, and if you don’t have chairs, put a tarp on the ground to sit on. Think also of what will happen if it does rain heavy. You want to avoid areas in the tarp where the rain builds up. Keep the tarp tight to avoid bulges. I also use bungee cords in the line from the tarp. 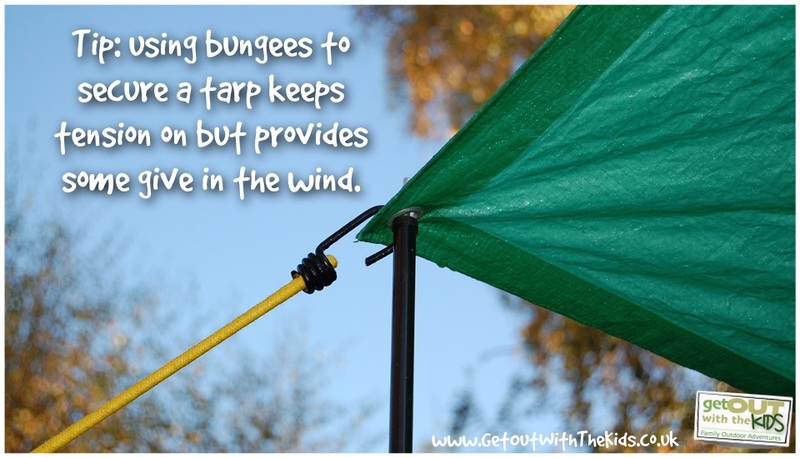 The bungee cords act as shock absorbers for gusts of wind and reduce the risk of tarps tearing, and yet keeps the tarp tight. Of course, if it’s blowing a strong gale, you’ll need to get the tarp down, but depending on wind conditions you may be able to leave your frame in place, making it quick and easy to get the tarp back up when the wind eases. I like the fact that the bungees stretch but what is not so good are the hooks. Bungees can be extremely dangerous. You basically have two hooks, which if are under tension, could be lethal. People do loose eyes. I now have some bungee cords that don’t have metal hooks. If you use bungees to save yourself having to tie knots, then look at a device such as the What Knot, instead of using bungees. It is important that you don’t pack your tent away wet. If you do, you must dry it out once you get home. That’s easier said than done – if not for the lack of drying space, it’s also the time it takes when you have a busy household. However, if you can let your tent dry out in the air before taking it down, you’ll be saved from that problem….except for under the tent where the air can’t dry it out. This is where using a tarp or other groundsheet can save you a headache, as only that will need drying when you get home. You can buy some really good tent footprint groundsheets for various models of tents. These enable you to protect the underside of your tent, and can help with pitching your tent as you place the footprint where you want the tent prior to pitching, which helps get the location right. Tent footprints are particularly useful for tents that are irregular shapes. Our tent is a simple rectangle and we have a relatively cheap tarp that’s lasted many years as an extra groundsheet that fits the dimensions of our tent with only a little folding. Equally important is to not have ‘spare’ bits of tarp sticking out from under your tent as these can collect water and run it under your tent. As when pitching a tent, always check for stones, thorns, lumps, and depressions when laying your tarp groundsheet. Our camping gear (and the rest of the stuff the family needs to take) got to the point where we had to get a trailer. When packing the trailer a tarp or two are the last things to go on top, with polls, lines, and pegs underneath. If it’s raining, I can quickly put up a tarp over the trailer and the car doors/boot. 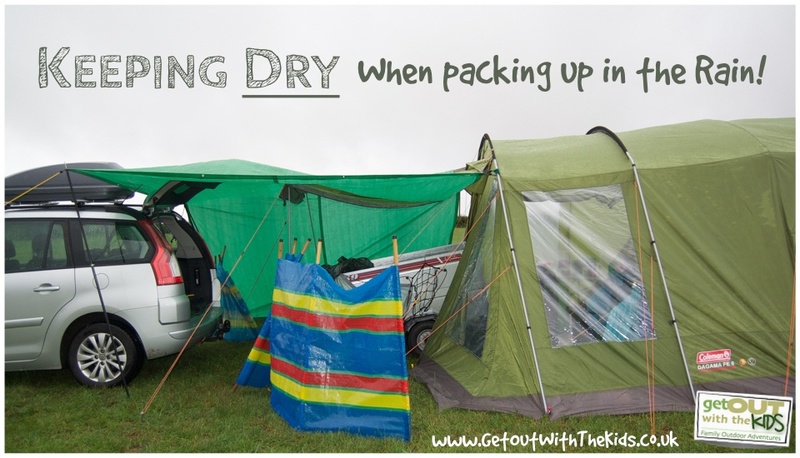 We can then get things out without getting them soaked, ideally waiting for the rain to ease, get the tent up, and then ferry stuff inside in the dry. Another important tip for pitching in the rain is to always take the inner tents out. I know this is extra ‘hassle’, and a lot of tents now say you can leave in and pitch in one, but we’ve found that the two-step approach is best in the British climate. By taking the two-step approach you can get the tent up quickly. Any rain that does come in the tent is easily wiped up. You can then ferry your inner tents into the tent (from under your tarp tunnel of course), and get the tent setup in the dry. Sometimes the weather can be really bad, with horizontal rain lashing into your tent. When the rain comes from the side, or even underneath if you are on a hill (yes, it can happen! ), then your tent might let in some water since the water is not coming from the normal direction. Having a tarp in your kit can save the day by providing an additional covering to weak points like doors. A lot of the pictures in this post are using a DIY approach. I bought some cheap tarps, some tarp poles, guy lines and paracord, and some bungees. The tarp I’ve been using is a cheap tarp, like a building tarp or an old groundsheet tarp. This is great for shoving under the tent or emergency situations, but you can get a better looking and easier to transport tarps that are made out of the same material as your tent. You can get these better tarps, and everything you need, in a tarp kit. In the video below we show you how to set-up your own tarp with a tarp kit. Step-by-step instructions on how to set-up a tarp kit. Read more. How to put a tarp up on your own. Read more. What to do with your tarp if it gets windy. Read more. The price of tarp poles are outrageous so there is a simple solution, without cutting poles at your camp site out of the woods, as some places doing so is not acceptable. If you ever did any painting in your own home, I am sure you used a paint roller adjustable extension pole. The sell for $12 or $13 dollars and if you purchase the longest extending type they will extent to 12 feet and lock at that length, and they will lock at all lengths shorter then that with just a twist of the lock mechanism. I have 5 or 6 of them in my vehicle every time I go out tent camping, and I also have like 5 or so tarps, various sizes. I can just about do any type of shelter including my tent in the mix. Hi. Me and my partner are thinking about going camping. We only have a small 3 man tent with no headroom. I’m thinking about using tarp to make a little bit extra room for cooking and things like that incase it rains. Would you be able to tell me gown would do this with only a small tent please? I don’t use carabiners, just loop the line around the poles. You need to have at least two lines going to ground from the poles. This could be a separate set of lines, or as you suggest, ground – pole – pole – ground, but you’ll need to double up on the pole to ground line. I generally have lines already set with some loops in the end of them that I can just hook over the spike on the tarp pole. So, for each pole, they’ll have two lines to anchor them, and then I’ll use a separate line for the ridge, which creates the tension between the two poles to keep them upright. Hi Gav. First time camper. Just purchased the Robens Mohawk tent. Although I am impressed by the large covered entrance, there is not to much cover from a good down pour. Do you have any ideas how to make it a larger covered area. Hi Gav first time camper here. What length of bungee do you recommend in relation to the tarp kit? Yes, you can put a tarp under the tent to protect the ground sheet. Just make sure the tent is completely covering the tarp, otherwise it can collect rain that pools under your tent, which won’t be good. You can also put a tarp up to cover your tent using just poles. See the diagram in the post for some ideas. 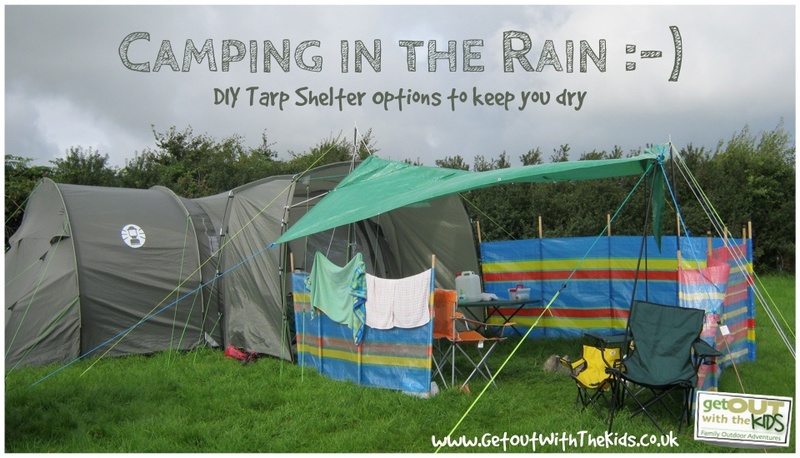 Makes sure you have a place where the rain can safely run off the tarp, otherwise it will just fill with water, and could even collapse on your tent. For privacy, put up some windbreaks around your tent. Hey Gav. Thanks for the great article. I’m looking for a 4m x 4m tarp to provide a cooking shelter but can’t seem to find one with eyelets at more points than the corners and middle of two sides. The idea is that I can use 4 poles to create a nearly flat roof. Any Ideas? Do you want it all to be flat? The problems I see is that a 4m x 4m it’s going to sag unless you use cord to create a support underneath, and if it rains, then the sagging could get worse. How about using some slightly longer poles in the middle eyelets, then you could use some slightly shorter poles at the corners. That would give the tarp more support and enable any water to run off. You might still want to run a line between the main poles on the ridge line, as 4m is a lot of material to support. Sounds like a plan. Do you recommend any particular tarps? Maybe 4m and 3m incase we go a bit smaller to reduce water load. I know this is an older article but it has some great ideas. Being in Canada I’ve never seen anyone use a wind break camping. A search on Amazon.ca reveals wind breaks for beaches that come with a heafty price and look nothing like the ones in your pictures. What are your breaks made of? The colourful ones are just cheap plastic tarp type material, with wooden stakes that you drive into the ground. The green one is made of the same material as tents, and is a lot lighter and easier to pack. 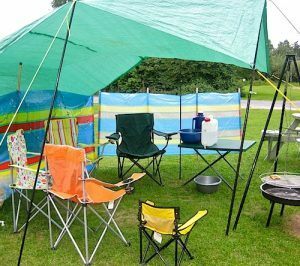 I am fairly new to camping including improvising with the use of tarpaulins for canopies etc. Apologies if this seems like a daft question, but when setting up a tarpaulin to shelter from rain and wind, it is my intention to have one side of the tarpaulin reaching almost down to the ground facing the wind. Does that sound like a logical approach? Would it also be safe to assume the tolerance of a tarpaulin in gusty weather could be judged by the tolerance of a conventional vertical beach wind break? PS. Love your site by the way, good reading! Thanks for the comments about our website. If you have the open end facing into wind and you have a campfire, you’ll find that the shelter will fill with smoke. The tolerance to the wind is slightly different with the tarp shelter than a windbreak, as the wind can get underneath a tarp shelter. However, if it’s just a light breeze, having the largest side blocking the breeze is good and should not put the tarp under too much pressure. As the breeze gets stronger, pitching the shelter with the wind coming lengthways to the shelter can be better, and then use a windbreak to shelter people sitting under the tarp. If the breeze is getting stronger, lower the profile of the tarp. 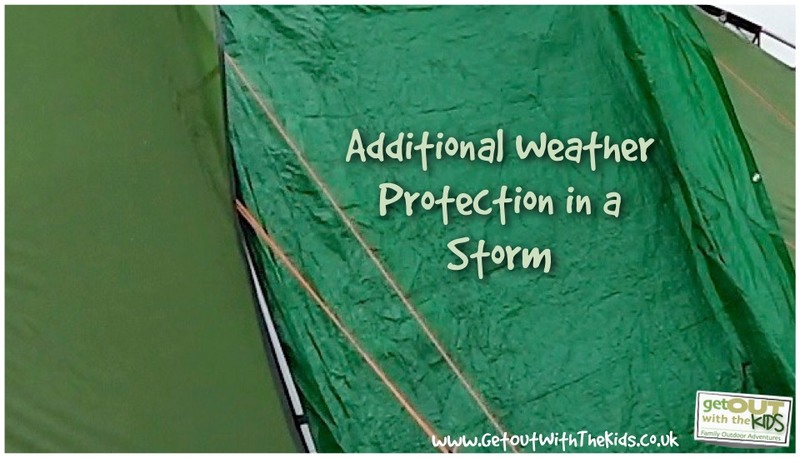 If a storm blows in and the wind gets too strong for the tarp, you can simply remove the poles and peg the tarp flat to the ground, using the tarp to cover any of the items that were under it. When the storm passes, simply remove the pegs holding it down and re-insert the poles. Many thanks for the reply, excellent info. The tarp on the page where you are sitting with your son, what is that tarp? That is exactly what I am looking for. That’s a DIY tarp made with a simple tarp, lines, and king poles. This year we’ve been using the High Peak, which you can configure in the same way. 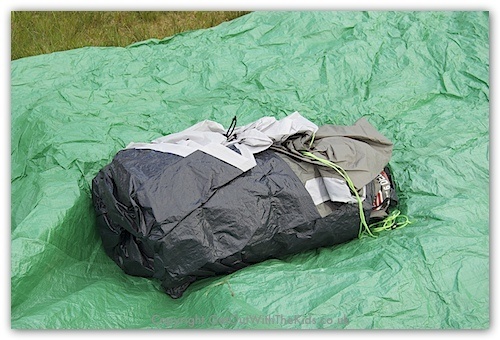 Thanks Gav for the link, a high peak tarp 1 it will be, not too big, not too small for two people. 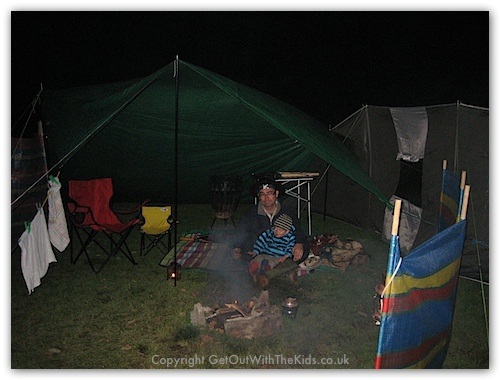 Your website it’s awesome, has opened my eyes to some amazing camping ideas. Thanks again. Here in Australia tarps are also popular for protection from rain when camping. Because of the extra effort to erect a tarp it is more common to see tarps used when camping for several days, such as Easter and Christmas holidays. A tarp also affords additional protection from the sun during hot weather. It offers a shaded place to relax and for children to play without getting sunburnt. It’s common to see tents erected under tarps with an air gap between the tarp and roof of the tent. The tarp offers the first level of protection from the sun. Any breeze helps to dissipate much of the heat that penetrates the tarp, making for a much cooler temperature in the tent.